The AT&T Tower reflecting the streets of Minneapolis. The other skyscrapers in the bottom picture are taller and more well known but my favorite is the AT&T. As the sun starts to set the blue tower in the day changes from emerald, to black, and then will glow orange with the street lights and the reflection of the Wells Fargo building. 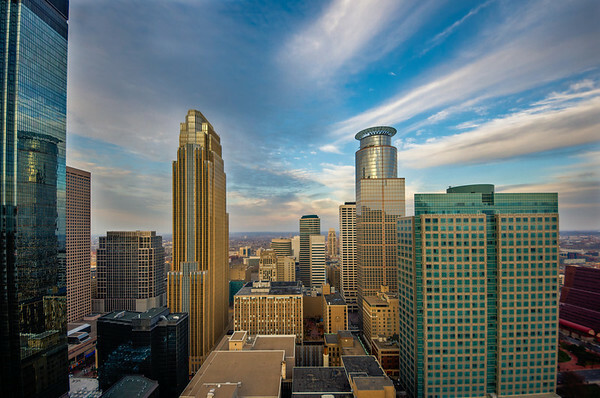 See more from the Foshay Tower or from my previous visit. 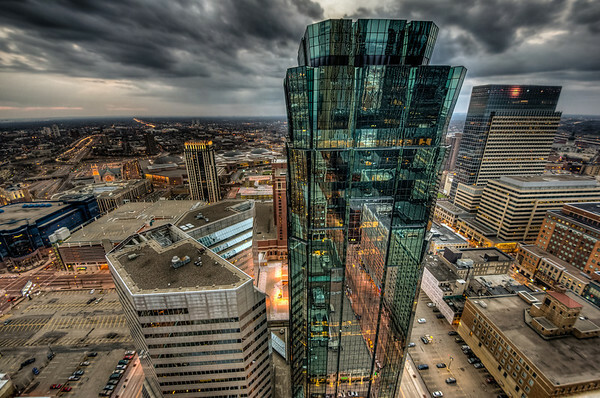 The Foshay Tower observation deck puts you in the middle of the city and half way up. In my view this is the best view. Any higher and you can’t make out much on the ground. It gets a little chilly up there but there are a couple heating ducts to warm up next to. Otherwise take a break and look through the museum on the floor below.